One day in January of 2008 I went to the airport at Bahia Solano to catch my return flight to Cali. 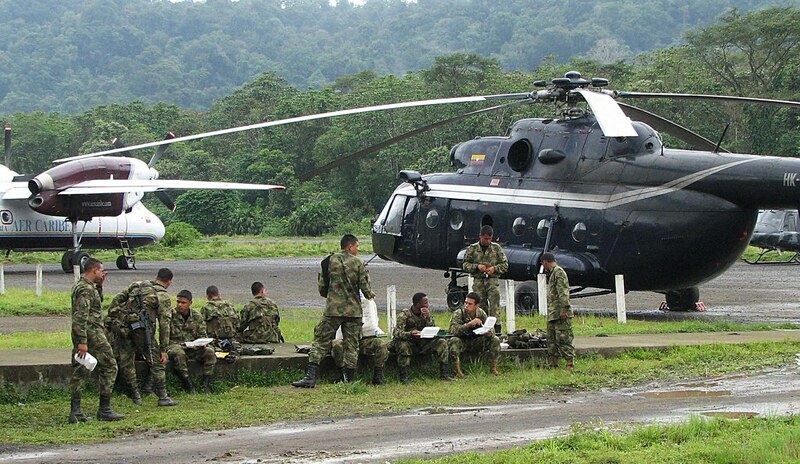 However no planes were flying as the runway was occupied by the Colombian Army. It turned out that that morning the Colombian guerrilla group known as FARC had kidnapped a group of tourists nearby. The photo is a snapshot of the soldiers having lunch before taking off to look for them in the Chocoan jungle. The victims were eventually released unharmed. I guess those expensive helicopters are necessary! Being a revolutionary must be an amazing experience. They stand for a set of ideology and have to be disciplined and suffer privations - but they might be entirely wrong and even ending up as cruel as the folk they view as oppressors, as war brings out heroes and demons too! I am so relieved that the two sides are moving towards a reconciliation. That's a good reason why I stay out of places like that.